SUMMER CELEBRATION benefiting Shepherd's Center of Hamilton County! You are here: Home / SUMMER CELEBRATION benefiting Shepherd's Center of Hamilton County! 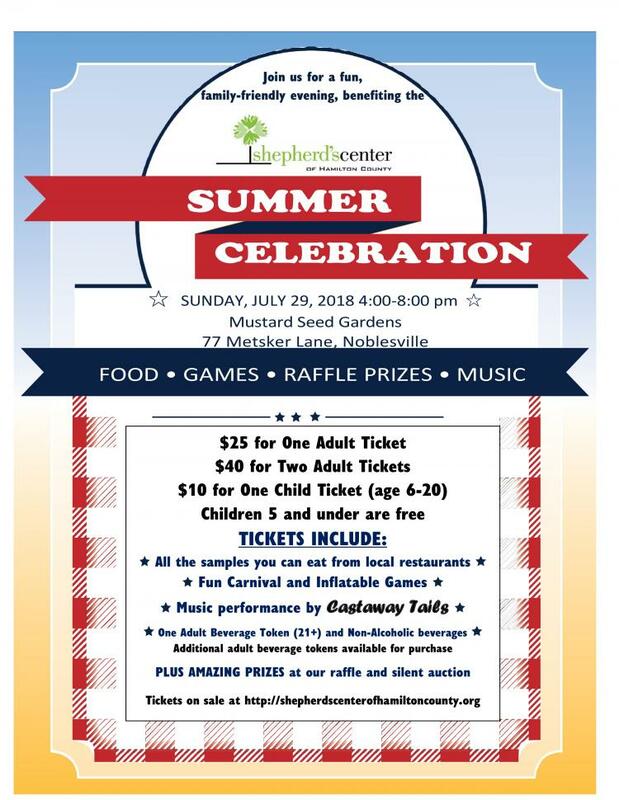 More About SUMMER CELEBRATION benefiting Shepherd's Center of Hamilton County! Join us for a fun, family friendly evening of food, games, raffle prizes, silent auction, music and more benefiting Shepherd's Center of Hamilton County! Tickets include all of your food, non-alcoholic beverages and 1 adult beverage token (for 21+ guests), music performance by Castaway Tail, and carnival games. Additional drink tokens, raffle tickets and silent auction prizes available for purchase! Realizing the growing need for quality programs in Hamilton County, Indiana, a Shepherd’s Center was started in 1985 to provide enrichment opportunities for adults 55 years of age and older. Over the years, SCHC’s role in the community and scope of service has evolved and expanded. Shepherd’s Center of Hamilton County is an advocate for older adults by ministering to their spiritual, physical, and personal well-being. Although Shepherd’s Center is an inter-faith organization, participants are not required to belong to any church or religious organization.